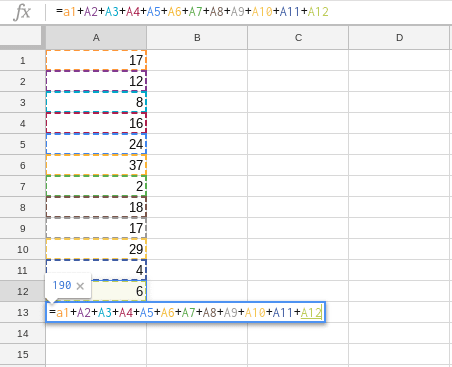 Adding numbers together in Google Sheets is easy to do. Spreadsheets are extremely powerful programs and learning how to do basic calculations is important. Once you’ve mastered how to do the basics you’ll feel more confident using a spreadsheet program such as Google Sheets. Let’s take a look at how to add numbers in Google Sheets. The great thing about spreadsheets is there isn’t necessarily just one way of working. Everyone calculates differently and as long as you get the right calculation at the end it does not matter too much about the calculation you used. However, some ways of calculating are more efficient than others. 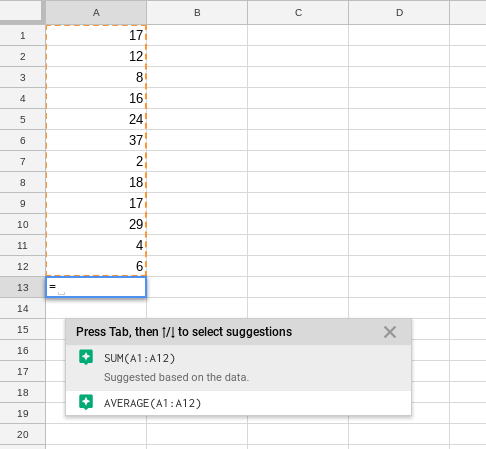 Google Sheets will let you calculate numbers in whatever way you feel is right. Providing the formula is correct it will bring back the correct result. There are two ways of adding numbers together in Google Sheets and we’ll take a look at both of them here. The way you decide to add numbers together is a personal preference, but you’ll soon see how one way is more efficient than the other. This is the most basic way of adding cells together in Excel. It is usually only ideal to add numbers together this way if you don’t have many cells to add up. You can see below we’ve got numbers in rows one to four and we want to add these numbers together. We’ll use the cell below, which is A5 to make the formula. You can either type the formula or after typing the ‘=’ sign you could click on cell A1 then press ‘+’ then click cell A2 then ‘+’ and so on. This will make it quicker than typing the whole formula. When you’ve completed the formula and before hitting the return key you should see something similar to what you see below. To make it easier for you to understand what the formula is doing Google Sheets highlights the different parts of the formula in different colours. You’ll notice where you’ve typed ‘A1′ it has turned orange, it’s also put a dotted orange border around the cell A1. This makes it much easier to understand formulas you’re entering into Google Sheets. You’ll also notice in cell A5 above the formula there is the number ’53’ in blue. This is the number the current formula will return when you press the return key. This is handy because if the number looks completely wrong, you’ll recognise this before completing the formula. Once you’ve hit the return key you should see something similar to what you see below. You can see the formula has correctly added the numbers in cells A1 to A4 and returned the value in cell A5, which is the cell where you entered the formula. As we’ve seen you can add cells together in Google Sheets individually. However, imagine how long this would take if you had to add a lot of numbers together. 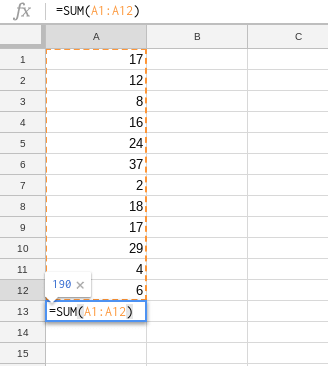 The best way to add numbers in Google Sheets is to use SUM. Using SUM provides a much quicker way of getting a formula to return the required result. This time let’s add a few extra numbers into cells A5 to A12. If we used the formula we’ve just done it would be much longer to type in, as you can see from below. This is why it would be much easier to use the =sum as it’s much quicker and you get the same result. As you can see from below this formula is much quicker to type and the result is the same ‘190’. Once you’ve hit the return key Google Sheets should bring back ‘190’ in cell A13 as seen below. The formula we’ve used above is asking Google Sheets to add together all the data within side a range of cells. It starts with cell A1 and ends in cell A12. Any numbers within side this range of cells will be added together. If any of these cells were blank or contained text, the formula would still work but would ignore any text or blank cells. You may have noticed when typing the formulas earlier into Google Sheets that it automatically recommends the formula you may want to use. This is really handy because it means you don’t need to do the formula yourself. Although this is handy it may not always be the formula that you want. However, it’s worth pointing out that sometimes Google Sheets will provide you with formulas that you may want to use. To use these when you start typing the formula and the dialog box appears with recommendations. 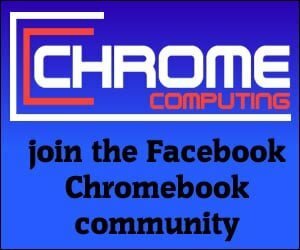 You simply tab down to the recommended formula you want to use and hit the return key. As soon as you enter the ‘=’ sign Google Sheets have recommended a couple of formulas you may want to use. 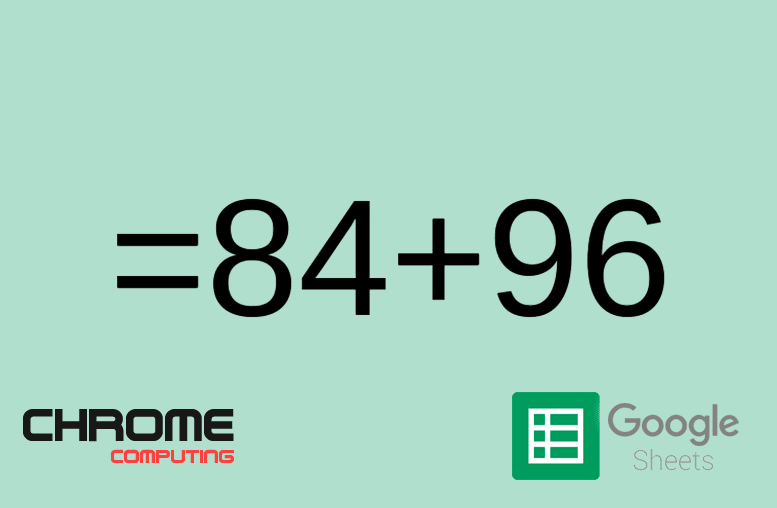 The formula we’ve just done using =sum is the same formula Google Sheets have recommended to use.